They say the best way to get a true sense of a city is to stroll around its street markets; and that statement couldn't be more true when it comes to visiting a market in London. Simply put, London is a city of markets. Dozens of bazaars populate the city’s streets, where stalls overflow with all kinds of goods, foods and general necessities. The markets are woven into the city’s fabric, adding character to each neighborhood. Even though there are many more markets than I list here, these were the ones I visited while i was in London. 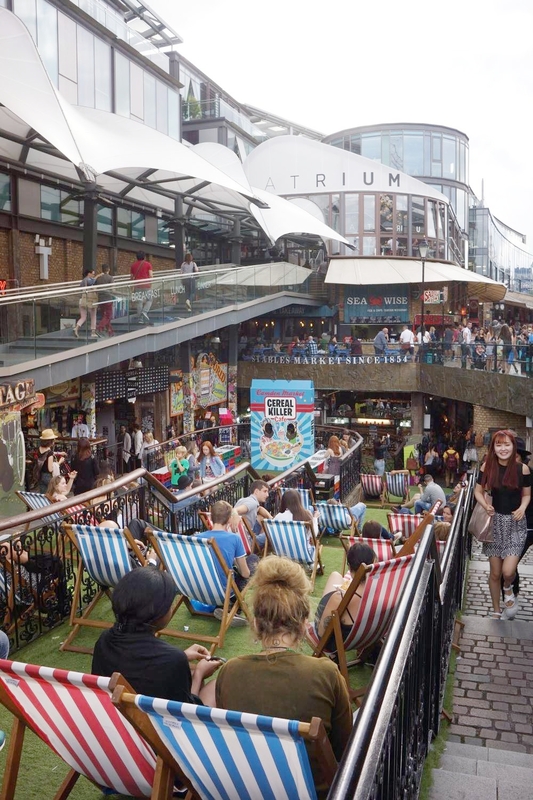 Technically several adjoining markets, this sprawl of stalls stretching from Camden Town tube to the Regent’s Canal is London’s fourth most popular visitor attraction. According to TimeOut London, every week, around 250,000 people come here to shop, sample street food and soak up the distinctive, still-grungy atmosphere. It is a great place to shop for funky clothes and original gifts from independent designers, all at an affordable price. Camden Lock Market is an arts-and-crafts haven while the Stables Market is a trendy spot for everything from quirky furniture to fetish clothing. Nearby Buck Street Market on Camden High Street (the one under a sign that reads ‘The Camden Market’) is best for T-shirts and touristy trinkets. The markets in Camden Town are open seven days a week and are always buzzing with activity. This beautiful indoor market it’s situated in historic Greenwich, within a World Heritage Site. Greenwich is home to around 120 stalls selling jewelry, clothes, second-hand furniture, interesting gifts, terrariums, art work, and many other things. According to TimeOut London On Tuesday and Thursday, you’ll find more antique stalls; other days have a greater arts and crafts presence. Once you’ve refueled at one of 40 food and drink stalls, you can pay a visit to the nearby Cutty Sark or Royal Observatory. Or just hop on a Thames riverboat back to central London. I simply must include Maltby Street market because it was the first market I visited in London. If you venture beneath the railway arches near London Bridge station, and you'll find the foodie playground of Maltby Street Market. There's a fantastic range of street food sellers lined along the Ropewalk over the weekend, from New York style sandwiches at Sub Cult, to Little Bird gin cocktails and scotch eggs (SO GOOD). Situated just off Shoreditch’s area, this weekly flower market is a total gem. Every Sunday from 8am-3pm, the picturesque cobbled street is packed with traders selling bulbs, herbs, shrubs, bedding plants and bucketfuls of cut flowers. Flanking the stands are around 60 interesting independent shops and cafés, many open only at weekends. Arrive super-early for the best selection of flowers, it gets very busy. I was mostly amazed by the truly beautiful flowers they had, I couldn't stop taking photos. Brick Lane should be on everyone’s itinerary when visiting London. This area is full of restaurants serving some of the best curry and is one of the coolest markets I visited in London. The front end of Brick Lane Market is comprised of endless prepared food stalls, from Mexican to Bangladeshi. Farther into the market you will find stalls of new and secondhand clothes, hand-made jewelry, posters, handbags, and one particular stall with some of the yummiest -and cheapest- macaroons I found in all of London. Saturday is the best day to visit, as the market is in full swing- and make sure to check out the famous street art surrounding the market and restaurants. This grand neoclassical building in the heart of Covent Garden is a London landmark. From what I learned, after the 80s the market was forced to relocate, and now, Covent Garden Market has reinvented itself as a serious shopping destination. On Mondays, it’s filled with stalls selling antiques and collectibles; then from Tuesday to Sunday, it welcomes a broader range of traders offering everything from handmade jewelry to artisan soaps. There are plenty of permanent retail units, too, mainly housing fancy brands like Mulberry and Tom Ford. Once you’re done exploring, which could honestly take hours, Jubilee Market across the piazza is great for gifts and trinkets. If you've seen the movie, Notting Hill, you'll recognize this market instantly. Portobello Road Market is the world’s largest antique market. Portobello Road Market is really five markets in one, with different sections dedicated to second-hand goods; clothing and fashion; household essentials; fruit, veggies and other food; and the main event: antiques. You’ll find the greatest range of antique stalls on Saturdays when the market gets so busy that it’s wise to arrive before 11 am. Portobello buzzes on Fridays too, but this fascinating street packed with characterful cafés, shops and drinking spots is worth a visit any time. Do you have a favorite market in London? I'd love to hear, tell me in the comments!